You’ve all had it happen. You just put the finishing touches on your project and you hit the Publish button. The files are automatically copied to the file server and users start get the updates right away. You double-check the publish and then you realize that you published the DEBUG version with all your program stops, disabled error checking, and wide open access to all program features! Edit: It looks like some people have had issues with the way I got things working. I was using a VB.Net forms application in VS2005 (and I think I tested in 2008 as well). The key is to find which constant works best for your situation. Drew Mcpherson says that DebugSymbols worked for him rather than DefineDebug. 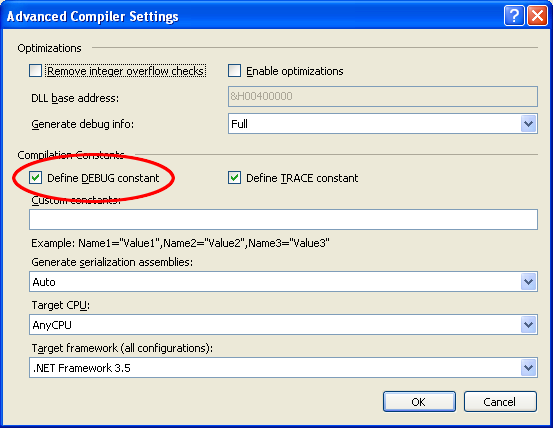 If you want even more control, another way of choosing a compiler constant is to define your own. 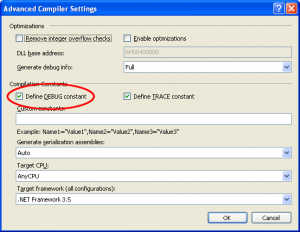 You’ll notice that below the “Define DEBUG Constant” box there is a textbox for defining custom constants. If, for example, you have three configurations, such as Debug, Release, and Publish, you could define a constant on the Publish configuration to prevent any other from allowing a publish. Edit 2: Another strategy altogether is to disallow publish for all build configurations except for the one you intend to distribute. This is also helpful if you have multiple deployment strategies such as ClickOnce for internal users and a Windows-installer for external users. In this case, publishing the wrong version could have dire consequences. Below is a sample of what I used in a multi-deployment scenario. Note that I’m calling out the actual names of the build configurations. <Error Condition="'$(Configuration)' == 'Debug External'"
<Error Condition="'$(Configuration)' == 'Debug Internal'"
<Error Condition="'$(Configuration)' == 'Release External'"
This entry was posted in Coding and tagged .net, ClickOnce, publish, tips. ← MacBook Pro Right-Click Drag, Fxx Keys, etc. I tried this and Visual Studio 2010 happily published it anyway! This solution seems simple, doomed to work. So I tried it with Visual Studio 2008 on a C# project. Unfortunately, it did not work and — sorry, I could not figure out why it didn’t. Thanks! DefineDebug worked for me. @farouk I updated the post with an example of using the names of the build configurations that you don’t want ClickOnce published. You should be able to easily adapt it to your situation.